Tehran, March 11 (IANS) Iranian President Hassan Rouhani on Monday left for his first official visit to Iraq with the aim of bolstering ties with the Shia-majority Arab country amid the US’ renewed sanctions on Tehran. During his three-day trip, Rouhani will meet his Iraqi counterpart Barham Salih and Prime Minister Adel Abdelmahdi, reports Efe news. "We are very much interested to expand our ties with Iraq, particularly our transport cooperation," Rouhani said before his departure. "We have important projects that will be discussed during this visit," he added. The Iranian leader will also meet Iraq’s top Shia cleric, Ali Sistani, and visit holy shrines. Iran’s Foreign Minister Mohammad Javad Zarif, who arrived in Baghdad two days ago, described Rouhani’s visit as "historic". 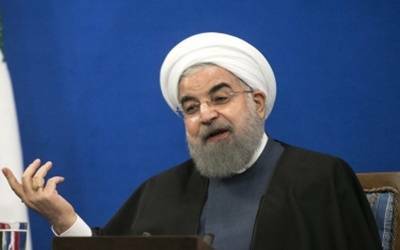 Rouhani was later set to take part in an economic conference with Iraq’s public and private sectors at a time when Tehran is seeking to increase trade after US President Donald Trump pulled out of the 2015 nuclear deal and re-imposed tough sanctions on the country. In addition, both countries are to sign agreements on petroleum, gas and electricity, in addition to carrying out railway projects and facilitating the procedures of issuing visas. Ties between Iran and Iraq have strengthened after the 2003 toppling of Iraqi dictator Saddam Hussein, who fought the 1980-88 war against Tehran. Iraq is a close ally of the US and also maintains good relations with Iran.